Social Security may have decreased the rate of poverty among retirees in the United States. * But it certainly hasn’t solved the problem of inequality. 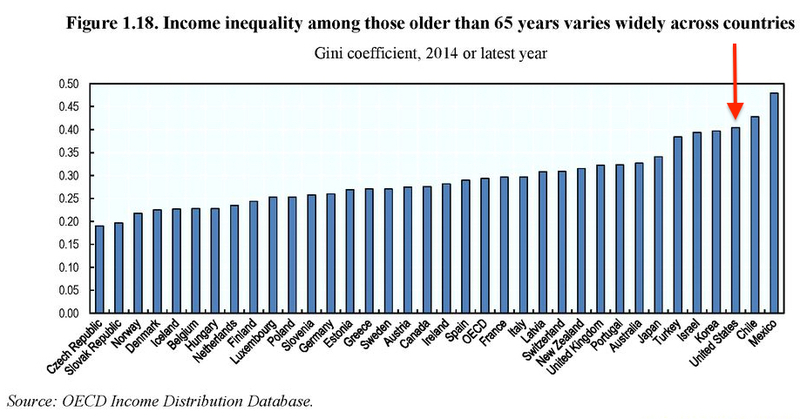 As is clear from the chart above, from a recent report from the Organisation for Economic Co-operation and Development, old-age inequality among current retirees in the United States is higher than in all other OECD countries, except Chile and Mexico. But wait, it’s probably going to get worse. That’s because, within each generation of workers, inequality has been rising. For example, researchers tracked U.S. income inequality for four different generations—people born in 1920, 1940, 1960, and 1980. For each group, inequality has been more extreme than the previous generation. The inequalities among people of working age are a primary reason for inequalities among older Americans. That’s because, with highly unequal current incomes, only households at the top are able to accumulate adequate retirement savings. Everyone else is forced to have the freedom to rely on Social Security payments. Americans are far more unhealthy than their peers in a number of other countries and people from low socio-economic backgrounds are particularly affected by bad health. And if ill health follows workers into old age or strikes them after retirement, they will need some kind of long-term care—but the social support for such care is much lower in the United States than in other countries. Someone with median income receiving home care for moderate needs in the some US states may have as little as 6% of the cost of their care paid by the social protection system. This compares to about 45% in the Czech Republic and Israel and almost 100% in Sweden, Iceland and the Netherlands. As the authors of the report observe, “ageing unequally starts early and builds up from childhood to old age.” This is no more so than in the United States where severe and growing inequalities in different dimensions—such as education, health, employment, earnings, and wealth—reinforce each and grow over the course of people’s lives. What we’re seeing, then, is high levels of inequality among older Americans. And, given current trends, it’s only going to get worse for future generations. *But the poverty rate among Americans older than 65 years is still high, at almost 20 percent, and the depth of poverty—the amount by which the average income of poor older people falls below the poverty line—is greater than 30 percent. And, just as worrisome, the poverty risk appears to be shifting from the old to the young. For example, while poverty rates for the elderly have fallen since the mid-1980s (by 2.5 percentage points for Americans 66 to 75 years), they’ve increased for younger workers (by 4 percentage points for those 18 to 25 years).